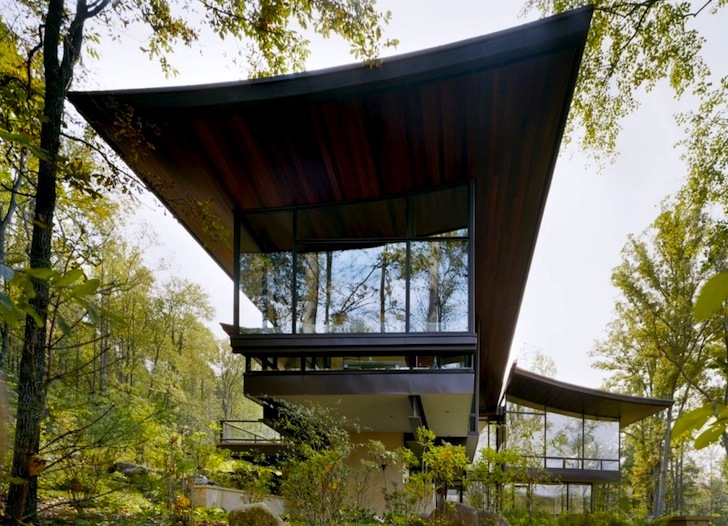 It's hard to know what to envy first about this swooping Blue Ridge House in Virginia - the fact that it is located on a verdant 200 acre farm, that said farm lies at the foot of the stately Blue Ridge Mountains, or the sheer majesty of its gorgeous design by Voorsanger Architects. Comprised of two levels of asymmetrical pavilions sheathed in glass, this eco-luxe beauty gets all its heating and cooling from geothermal energy. Very similar to a little prefab cottage from South Africa that we recently featured, the Blue Ridge House in Albermarle County has a steel frame and glass cladding. This has multiple benefits, not least of which is the first class view that every single person in the house enjoys. It also permits plenty of daylight, while the sculptural overhanging roofs provide shade to protect against excess solar gain. The home’s renewable energy system is by far the most ecologically-sensible aspect of this private residence. No fewer than ten geothermal wells provide all of the home’s heating and cooling, aside from a lovely fireplace situated in the downstairs family room, ensuring near-independence from the national grid. The use of stone, timber and other natural materials warms up the stout linear configuration, and did we mention the view?